I’ve had the pleasure and luck to visit Costa Rica twice now, each time spending about a week in the mid-elevation rainforest around the Arenal volcano, then heading to the drier, hotter portions of coastal Guanacaste to search for the Middle American Rattlesnakes that live there. I’ve been fortunate (and tired!) to have found several of them, and a lot of great stuff along the way. There’s no way to sum it all up into one or even a dozen posts, so I’ll just be adding photos from Costa Rica to this feed, maybe with a tag or two if necessary. 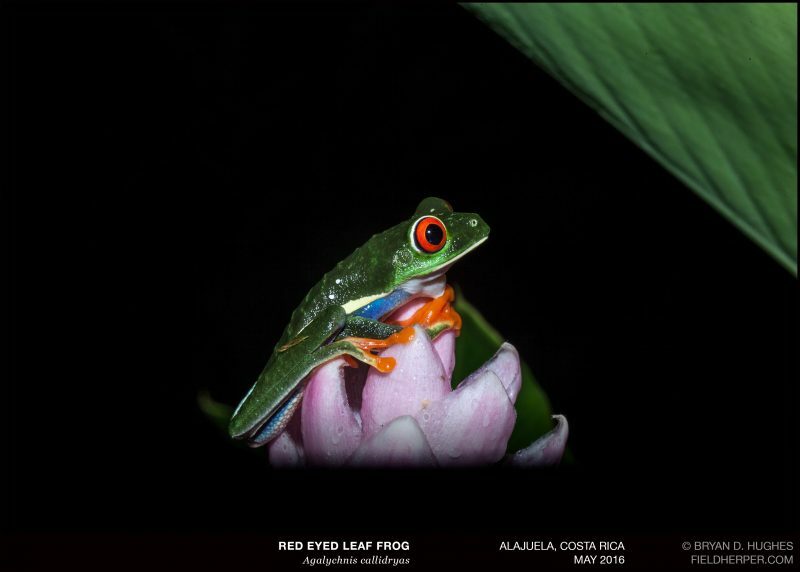 To kick that off, here’s one of the most iconic amphibians from the area, the Red Eyed Treefrog. They were everywhere in the gardens surrounding the hotel. This entry was posted on Sunday, January 22nd, 2017 at 8:02 am	and is filed under Amphibians. You can follow any responses to this entry through the RSS 2.0 feed. You can leave a response, or trackback from your own site.